ST-KFIM Fabric Inspection Table for Knits with optional data collection and analysis system(4-point system) to handle a wide range of fabrics, from tension-sensitive elastomeric and lycra fabrics to stable woven, technical and upholstery materials. This machine can be supplied to operate fromplait/loose fabrics to roll, or with various other fabric inletand outlet options. 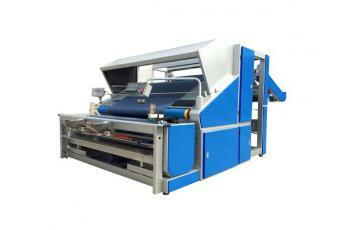 AUTOMATIC CAMERA INSPECTION SYSTEM COULD BE INSTALLAED ON FABRIC INSPECTION MACHINES. Suitable for Knitted Fabrics, Input from Tubular Fabrics and Output from Open Width Knitted Fabric in Rolls. Suitable for Knitted Fabrics with Versatile Fabric Input and Output forms,especially for tensionlessly checking Fabrics from Roll/Plait to Roll/Plait. Suitable for continuous fabric checking. Big Batches are driven by Center Drive System with no contact to output in small rolls. Unique mechanical and electric device combination for making fabric feeding, delivering and re-winding synchronous. Fabric roll length and weight can be taken by industrial standard measuring systems with digital readouts to give consistent fabric roll assessments. Fabric controlled from input to electro/pneumatic edge guilding system for perfect roll generation. Optional systems are available for different fabric input and output presentations, roll to roll, continuous fabric input and plait input and output. Heavy produced rolls can be pushed by the pneumatic cylinder arms so as to save labour power. Full width cutting at the end of processed roll, fast and accurate.